Sgu, H.; Ma, J.; Yu, H.; Hurlimann, M.
Debris flows that involve loess material produce important damage around the world. However, the kinematics of such processes are poorly understood. To better understand these kinematics, we used a flume to measure the kinematics of debris flows with different mixture densities and weights. We used sensors to measure pore fluid pressure and total normal stress. We measured flow patterns, velocities, and depths using a high-speed camera and laser range finder to identify the temporal evolution of the flow behavior and the corresponding peaks. We constructed fitting functions for the relationships between the maximum values of the experimental parameters. The hydrographs of the debris flows could be divided into four phases: increase to a first minor peak, a subsequent smooth increase to a second peak, fluctuation until a third major peak, and a final continuous decrease. The flow depth, velocity, total normal stress, and pore fluid pressure were strongly related to the mixture density and total mixture weight. We defined the corresponding relationships between the flow parameters and mixture kinematics. Linear and exponential relationships described the maximum flow depth and the mixture weight and density, respectively. The flow velocity was linearly related to the weight and density. The pore fluid pressure and total normal stress were linearly related to the weight, but logarithmically related to the density. The regression goodness of fit for all functions was >0.93. Therefore, these functions are accurate and could be used to predict the consequences of loess debris flows. Our results provide an improved understanding of the effects of mixture density and weight on the kinematics of debris flows in loess areas, and can help landscape managers prevent and design improved engineering solutions. Sgu, H. [et al.]. 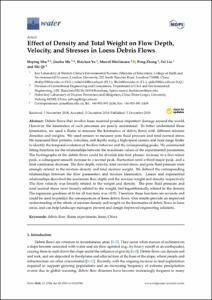 Effect of density and total weight on flow depth, velocity, and stresses in loess debris flows. "Water", Desembre 2018, vol. 10, núm. 12, p. 1-21.